Katherine Maxwell-Rose lives in one of the most diverse neighbourhoods in the country, but it’s not easy to find children’s books that reflect the reality of her and her son’s community. 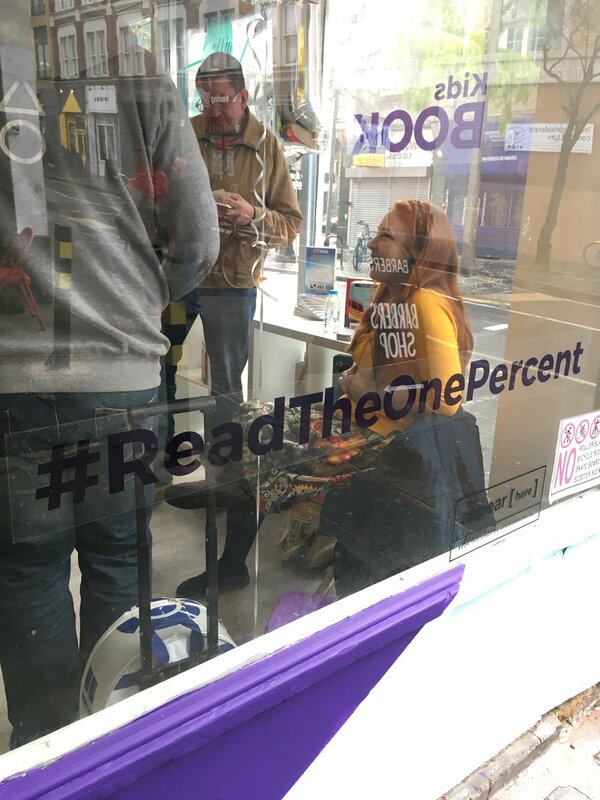 She visited the Knights Of pop-up bookshop in the hope of being able to #ReadTheOnePercent. Last week I took my one-year-old son along to the local library for the weekly story and song time. The librarian announced that it was a ‘special’ session to celebrate Black History Month. We sang a few songs (which included ‘Yellow Bird’ and ‘Brown Girl in the Ring'- as African-Carribean folk songs), followed by reading one story, from South Africa. I left thinking that surely Black History Month was about more than this. This single (albeit well-meaning) session actually pointed out how little representation of other cultures there is in kids’ books and songs. Given the fact that I live in a neighbourhood with an 83% non-white-British population, perhaps we could slack off ‘The Wheels on the Bus’ and ‘Twinkle, Twinkle’ to provide space every week for a more diverse array of nursery rhymes, stories and folk songs. 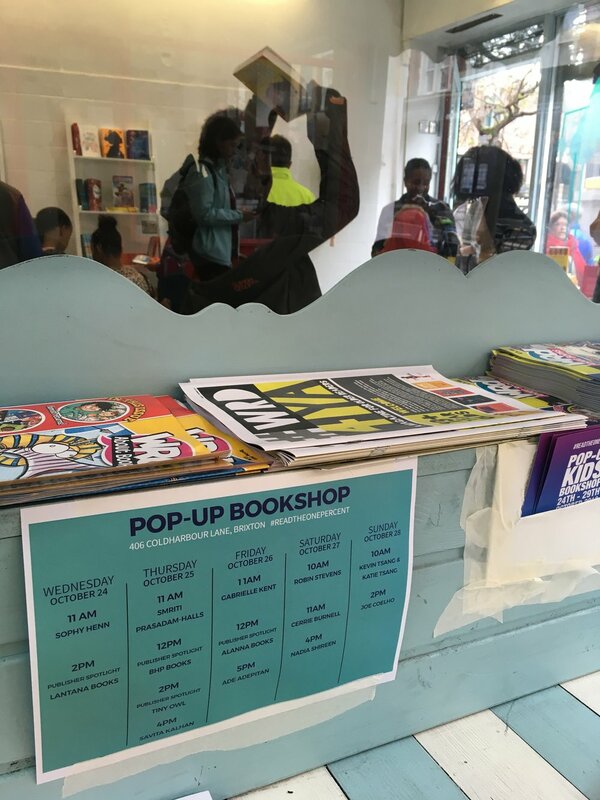 I was excited (and just a little relieved) then to discover the pop-up children’s bookshop in Brixton championing diversity hosted by the new children’s publishing house, Knights Of. They make ‘Books for every kid – starting with who’s behind the scenes’. Set up a year ago, Knights Of is a response to the findings of a report that only one percent of all children’s books published in 2017 featured a Black, Asian and Minority Ethnic (BAME) protagonist and only four percent had any BAME characters at all. 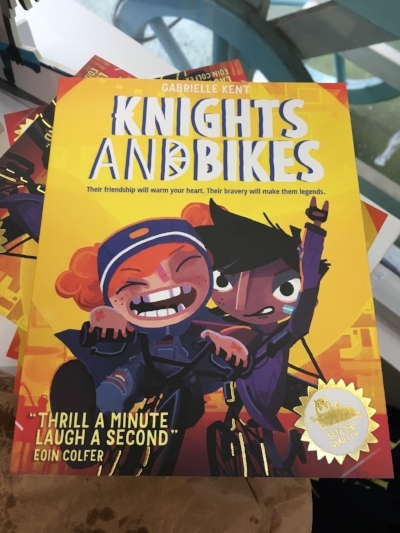 Their premiere publication is Knights and Bikes by Gabrielle Kent about Demelza and Nessa; two girls who like to ride their bikes and fight knights. As they explore a sleepy Cornish island, they uncover the mystery of the Penfurzy Knights and ‘face down danger with frisbees, water balloons, feathers and a toilet plunger’. Although it’s an adventure with two girls as the protagonists what I think looks particularly appealing about this read is that it’s not marketed just to girls. Knights Of co-founder, Aimée Felone explained to me that they intend to promote their publications to both boys and girls rather than heading down a more conventional gendered marketing plan as many publishers often do. The books on offer vary from picture books for toddlers with a range of different kinds of characters - such as Ruby’s Worry by Tom Percival about a child who has a worry that grows into a monster - to ‘issue-based’ teen fiction featuring tougher topics like racism and identity. The Muslims by Zanib Mian about the life of a nine-year-old Muslim boy bullied in a new school and written in the comic, notebook style of a Tom Gates book, intentionally tackles difference head on. Dipping in, I thought it would be a great read for any child wanting to understand more about Islam and specifically to help them grasp and explore what it’s like to be a Muslim child living in the UK today. I was particularly drawn to the books Aimée describes as ‘incidental diversity books’ where the character’s difference is either only briefly alluded to or not mentioned at all; it’s just a fact of the story rather than forming a key part of the narrative - such as in Knights and Bikes. I picked up Teatime with Ted by Sophy Henn for my son; a celebration of all the fun food you can eat for tea to encourage him to be a little less fussy when it comes to mealtimes. Ted is a cute kid with big red boots and a great orange bobble hat - and brown skin, unlike the characters in most of the other books we have at home. But it’s not about that, it’s about eating baked potatoes with your tiger, crocodile, penguin and kangaroo mates. I also bagged Izzy Gizmo by Pip Jones and Sara Ogilvie about a girl who loves to invent and fix things up; it’s a fantastic read where Izzy is continually illustrated in more traditionally ‘masculine’ scenes using her spanner and screwdriver, clutching a hammer and a drill, surrounded by books on machines and electrical circuits. Looking around the shop it struck me however, that there is still work to be done on placing boys in more traditionally ‘feminine’ scenes, roles and narratives in our children’s books and stories. As YA author, Corinne Duyvis has said, ‘We need all kinds of books. Books where diverse identities are an issue. Books where they’re barely mentioned. Books that cover the middle ground’. I’m bringing my son up in one of the most diverse neighbourhoods in the country so it’s vitally important to me that he sees representations of all different kinds of people in the books we read together as well as the TV shows and films we watch. As Aimée highlighted to me; ‘Our children are not growing up in a homogenous world. We show difference to create empathy.’ It’s astounding that so often we share and pass on a reductive, singular narrative which presents a world totally unlike the one our children are surrounded by. Stories are, after all, what have always connected us together; despite our differences. Stories can nurture in us a sense that in many ways we are more similar than we are often led to believe and are all human. In these times of tension and division we need stories like those more than ever. The KnightsOf pop-up book shop ran in Brixton from 24th-29th October. To see more check out #ReadTheOnePercent. For details about future developments and projects, follow @_knightsof. Katherine Maxwell-Rose is a writer, activist and speaker passionate about social justice, crossing divides and creativity. We introduce our all about books issue and the 2018 gift guide.